Facebook is one of the worlds largest social media platform with billions of daily users. The population of Facebook users is quite vast and as such, you can build a Fan base and make a lot of friends on Facebook. These friends and followers on social media can be very discomforting too. Sometimes you get some very annoying and irrelevant notifications from those persons on your contact and you may be thinking of a way to stop these notifications temporarily instead of blocking the person or unfollowing the person, Facebook was initially limited to these options Until Facebook embedded a feature that allows you shut a notification from someone on Facebook for a duration of 30 days, I am happy to tell you that it is possible to snooze someone on Facebook and I will show you how to. 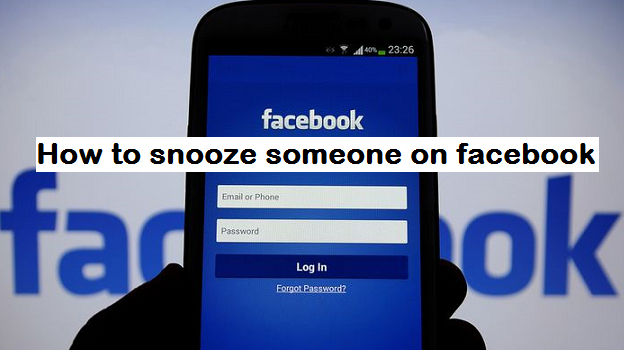 What does it mean to snooze someone on Facebook? Snoozing on Facebook is a feature that lets you hide someone from your News Feed for 30 days. When you snooze a person or a page, you’ll still remain friends or a fan of the page. If it’s a friend that you’re snoozing, they won’t receive any notification that you snoozed them, so they’ll never know. cool right? This is perfect for the times that your friends or a Page you follow are getting a little bit noisy with news feeds. Examples might include when they’re on holidays or trying to get you to vote for them in a competition of any sort. After the 30 days are up, the person or page you snoozed will appear in your News Feed again and you can see their posts and updates. This feature literally gives you control over news feed you see on Facebook. You do not have to block so many of your friends anymore, you think their updates are getting spammy and annoying? feel free to make do of the snooze feature on Facebook. Facebook promises you would be alerted just before the snooze duration ends so that you can alter or redo the option. 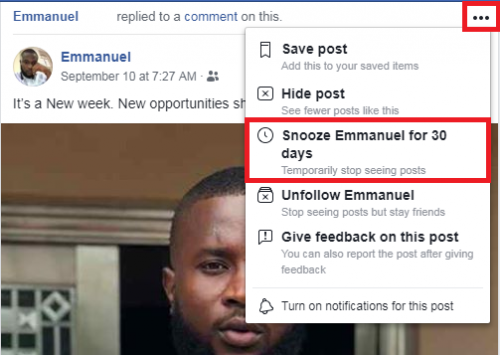 I personally find this feature very interesting and useful, I know you are itching to know how to snooze someone on Facebook so that you can temporarily shush those annoying friends updates and pages, without further delay here’s how! 3. Click on snooze ‘the person’s name’ for 30 days. Snoozing a page’s post works the same way as snoozing a friend’s posts. Click or tap the three horizontally arranged dots in the top right corner of the post of a page you want to snooze and in the menu that opens, click or tap the option that says Snooze ‘Page name’ for 30 days. Once you click the snooze option, you would see a notification below the post that the person or page has been snoozed. Q: Do I have to wait for the snooze to expire before I can undo the snooze? A: No, you can undo snooze at any time, you can even undo it immediately by clicking ‘Undo’.